During the 2017-2018 cycle, osteopathic medical students showed a growing interest in research projects in Osteopathic Manipulative Medicine. 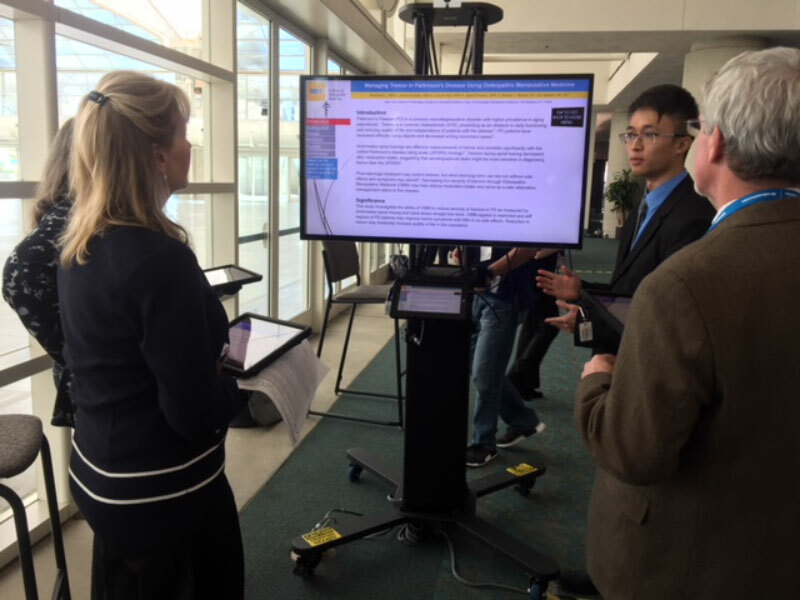 At the 2018 OMED, nine posters were entered into the OMM portion of the Student Poster Competition presented by the AOA’s Department of Research and Development. FORCE is proud to be the sponsor of the student awards in the Clinical/Osteopathic Manipulative Medicine Category. FORCE President, Virginia M. Johnson, DO, FAAO, served as one of the judges of the competition. First Place was awarded to Raymond Li, from the New York College of Osteopathic Medicine at NYIT. His project, “Managing Tremor in Parkinson’s Disease Using Osteopathic Manipulative Medicine,” utilized spiral tracings as a tool for quantifying severity of tremors in Parkinson’s patients, before and after osteopathic treatment. Second Place was awarded to Nicole Angelo, also of the New York College of Osteopathic Medicine, for research in, “The Effect of Osteopathic Manipulative Medicine on Oxidative Stress following Mild Traumatic Brain Injury.” Her study examined 8-hydroxy-2′-deoxyguanosine (8-OHdG) in the urine as a biomarker for monitoring oxidative stress in patients in the acute phase of concussion injury that received osteopathic manipulative treatment. Congratulations to all the osteopathic medical students who participated for upholding the osteopathic research tradition, Dig On!